Arguably the first play in a Shakespearean tetralogy, Richard II is a unique and compelling political drama whose themes still resonate today. It is one of the few Shakespeare plays written entirely in verse and its format presents unique theatrical challenges. Politically engaged and controversial, it raises crucial debates about the relationship between early modern art, audience response and state power. This collection provides a comprehensive and up-to-date survey of the critical and theatrical history of the play. 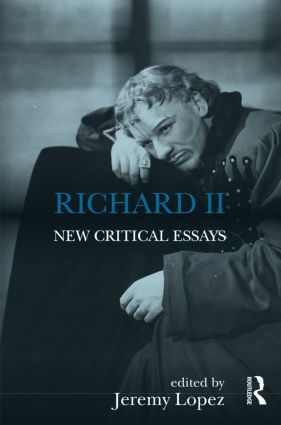 The substantial introduction surveys the history of critical interpretations of Richard II since the eighteenth century. The eleven newly written critical essays by leading and emerging scholars in the field then adopt an eclectic range of critical approaches that encourage scholars and students to pursue new and imaginative directions with the text. Jeremy Lopez is Associate Professor of English Literature at the University of Toronto, Canada. He is author of Shakespeare Handbooks: Richard II (2009), Theatrical Convention and Audience Response in Early Modern Drama (2004) and numerous articles on the drama of Shakespeare and his contemporaries.